Prokaryotics Inc. is an authentic antibacterial discovery organization committed to bringing forth innovative therapeutics to address the problem of multidrug resistant bacteria and combating the emerging global crisis of antibiotic resistance. We are a start-up company resulting from the licensing of several novel antibiotic programs from Merck & Co., Inc. – by a team of former senior scientists at the company including the head of the Antimicrobial Early Discovery Unit, to optimize a number of Merck’s early-stage programs. 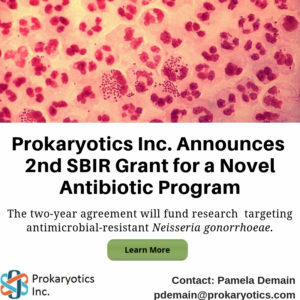 Prokaryotics has negotiated worldwide rights to develop, manufacture and commercialize pre-clinical assets and programs targeting both Gram-negative and Gram-positive bacteria. Au·then·tic (/ôˈTHen(t)ik/) - Of undisputed origin; genuine. In occupying this critical yet largely neglected niche in the development pipeline, Prokaryotics Inc. heralds an authentic culture of creativity, commitment, and collaboration and is founded to leverage its deep knowledge of bacterial physiology, innovative screening strategies, and medicinal chemistry expertise to debut new classes of antibiotics targeting cell envelope biogenesis - the fundamental barrier erected by bacteria to naturally withstand the effects of antibiotics. The basic idea is to develop new antibiotics that target the process of bacterial cell envelope assembly. Like penicillin and other beta-lactam antibiotics, history tells us that entirely new agents that target novel, druggable, broadly conserved essential enzymes involved in this process offer the greatest opportunity in terms of efficacy, safety, and treating otherwise antibacterial resistant bacteria. Each of Prokaryotics’ programs is strongly aligned with this goal. For more information, and to be added to our distribution list, please contact us.